Only have to work a half day today, so this afternoon I am running over to Mom’s for an editorial meeting on her book. I’ll stay there for the afternoon and have supper with them. I’ll bring the sweater along – making some headway on the sleeves, and hope to really get some serious knitting done this weekend. Niece B is coming over Saturday afternoon to spend the evening with us – there will be food and games and we hope a trick-or-treater or two or three, but no matter, we will have good food and fun. Sometime this weekend, I hope to make my pallet/snow covers for the shrubs, it is getting to be time. And I will scoop leaves out of the pool and put some chlorine in, and whatever else the pool people recommend for the winter. we got nearly three inches of rain the other day, at this rate, I won’t need to buy water for the pool, it will be full by spring! with no post from me…mostly because there seems to be nothing really to write about. 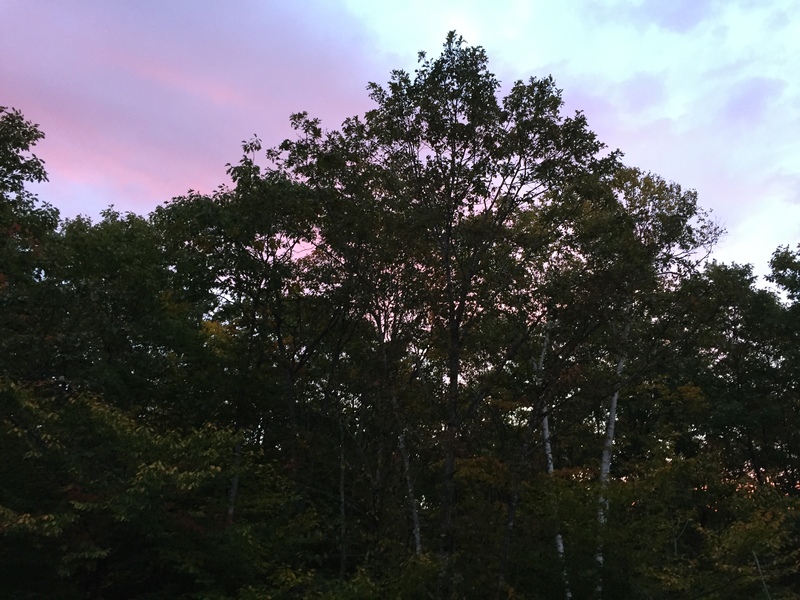 I feel like I am in a bit of a slump – is the change in the light? Not sure. Anyway, I never even tried to get the book for book group, so will be skipping that this month. Again. 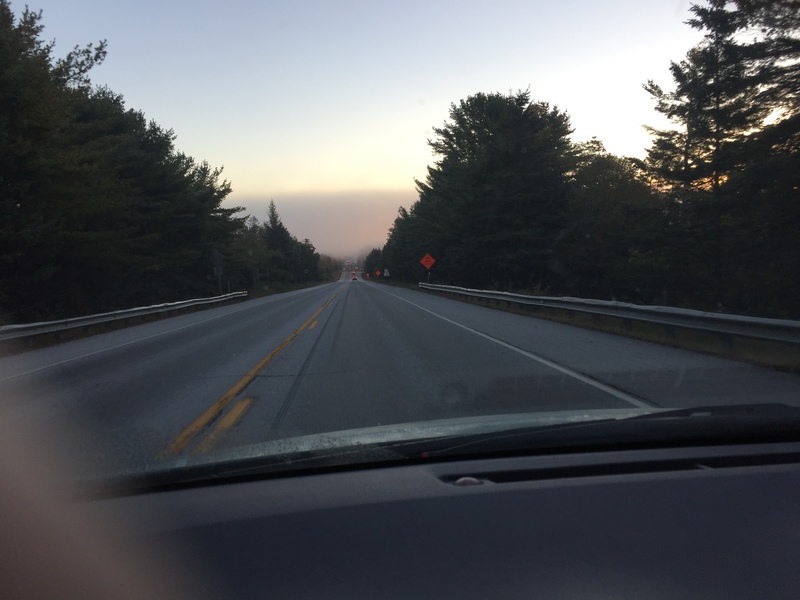 This weekend was slow and steady – we went to Ellsworth Saturday morning, and I pulled a lot of my inventory out of J and B Atlantic, so I could get ready for the holiday shop in Bucksport. I left a fair number of things in Ellsworth, of course as I don’t want to miss an opportunity for holiday shoppers! But it saves me knitting up a storm when I don’t need to, always good. While we were there, we ate an early lunch at Fuddrucker’s, and then did the grocery shopping at “the big store” where they have heard of unscented everything. Thank God, because we were almost out of unscented everything. Sunday I ran to the dump, then cleared up some of the junk from the screened porch – pile of pool equipment went down cellar, candles and other knick-knacks came in and got cleaned up. I also cleaned a lot (but not all) of the leaves out of the pool. From the sides, I did not get in it! Brrrr. That seemed like enough chores for one day, so I settled back on the couch with the knitting. Anyone would then expect me to have made great strides in things, right? Not so much. I did finish a chemo hat, but as it was almost done, that is hardly anything to brag about… and I cast on the sleeves of the baby sweater I am making. And I cast on another chemo hat – my rendition of a Hurricane hat. But I was a lethargic knitter at best. Maybe because what I want to be casting on is a panda food cowl? Not sure, but I didn’t let myself do it. Sweater and hats have to get done first. The hat is in some unknown yarn mom sent over – feels like possibly alpaca, in a slightly bulky worsted weight, so the hat goes fast and I should finish it up tonight, then focus solely on the sweater until it is done. I did take the time to go through the things I have for the Bucksport shop, and it looks like I have enough to get started, but need to add some more holiday inspired things, and some more hats. Hard to believe I haven’t enough of those! But between Etsy, the shop in Ellsworth and the shop in Bucksport, it takes a lot to give a nice array. Luckily, they do work up fast in bulky yarn. I also went through the buttons I have been collecting all summer – I got some nice ones! So I am looking forward to being able to work on those things. Procrastinated a bit on Mom’s book – we are struggling with tenses now – some things are in present, some in past. We need to meet to talk about how she wants it to read, but I did a brief survey of memoirs on my bookcase, and found that the good ones are in the past tense. Which means lots of careful editing. 🙂 Which means setting up a spot to work so it is easy. Still haven’t sorted out the internet issues, and that makes me grumpy – having to be hooked up to the wall defeats the purpose of a laptop. Which is also part of why I don’t post as often. And as to the photos – still learning A’s camera which I confiscated. 🙂 Went to take a picture of the cats being cute today and the battery was dead. Again. Really? So I charged it, but of course, the cats had long since stopped playing in the sheets of paper by the time the camera was ready, lol. A worked on the bookcases for the upstairs – all but one are glued up nice and square. The last one will wait until the first 6 are installed, so that she can make sure it really will fit in the remaining space. What this means in my world is that I have to paint the loft, and choose a paint color for the insides of the bookcases. The walls and ceiling of the room and outsides of the bookcases will be a very soft pale blue/gray, like all the other main rooms in the house. For the insides, I could go with the darker periwinkle blue that is the accent color in the kitchen, or I could do something totally different. I am contemplating a bright red. Or a bright turquoise. Or a soft turquoise. Or a raspberry pink-red. Or a different color in each one. You see the problem. What do you guys think? They are plain, simple cases, unlit except for room lighting, and presumably will be filled with books. They can’t be seen from anywhere else in the house, so it should be immaterial that the room on one side is creamy yellow with periwinkle trim, and the room on the other side is pale pale pale pink (almost white) with raspberry red trim. But it might not be. So what’s the big deal, Salpal? Just pick a color! Well, it’s the internet’s fault. 🙂 Everyone does such cool things in their houses, or at least on their blogs, and I want to have it look perfect when we finish, because it has been SUCH a chore getting these done. Once I choose a color, then I will think about book ends for some shelves. I’d really like some shelves NOT to be filled with books, so I need book ends to hold the books upright. I also have pretty little things packed away that would look nice on the shelves. I think. Depending what color(s) I choose. Yeah, I am going back onto the couch to knit a hat. Or a sweater. And look longingly at the half-finished sweater vest (remember it? Blue and teal? ), the half-finished scarf/stole/shawl or whatever it is (remember it? Teal and gold? ), both of which had to get put aside for hat and sweater knitting, and will likely stay aside for some more hat knitting, but which I do want to finish soon…so I can cast on Panda Food… and other things that aren’t priorities anywhere but in my little knitting brain. Which is why I spent some time looking at beads online, for a shawl I have no business thinking about. Thanks for hanging in this long… I promise pictures and happy brightness again shortly. OH YEAH! I almost forgot to tell you – Thursday night I thawed out the tomatoes and canned them. Which ever one of you lovelies it was (sorry I don’t remember!) who told me to freeze them as they ripened and can them all at once – THANK YOU – brilliant idea! I had about a gallon and a half of tomatoes, which somehow came out to 4 pints when peeled and excess water drained off. A lot of work for a little goodness, but worth it, I think – to have my own tomatoes a few times this winter will be grand. Hard to believe it will only be a few weeks until the trees are bare and we have white everywhere. Which leads me to this picture, taken this afternoon. 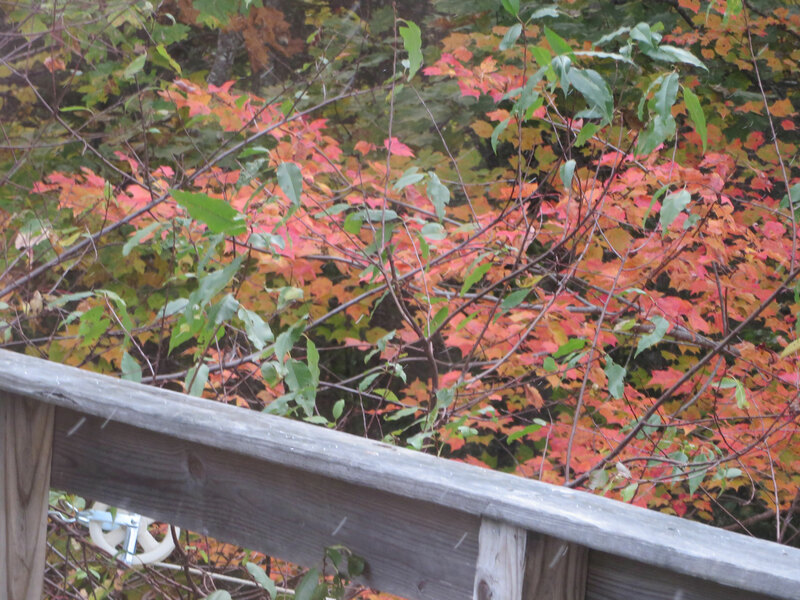 A said to me “Hey, look outside!” and this is what I saw – the first flakes. Those little white dashes against the railing are snow flakes speeding to the ground, where thankfully, they melted. 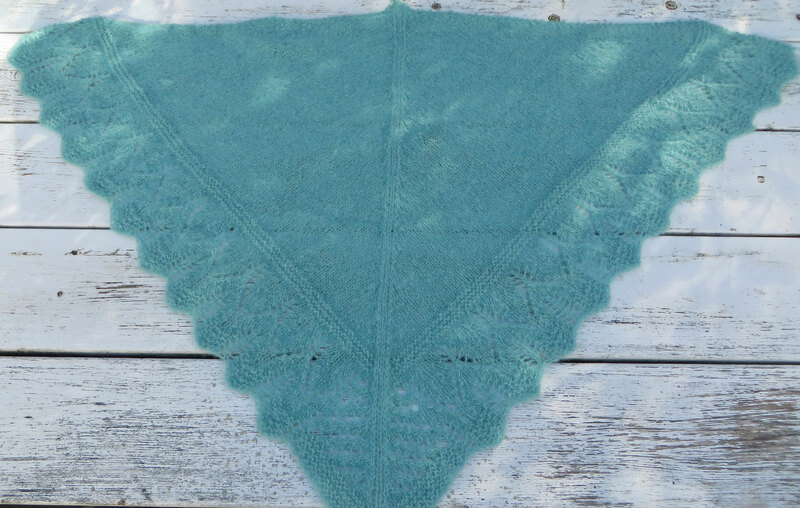 Here’s what I am working on now – Charleston baby cardigan in Tosh light. The color is composition book gray. 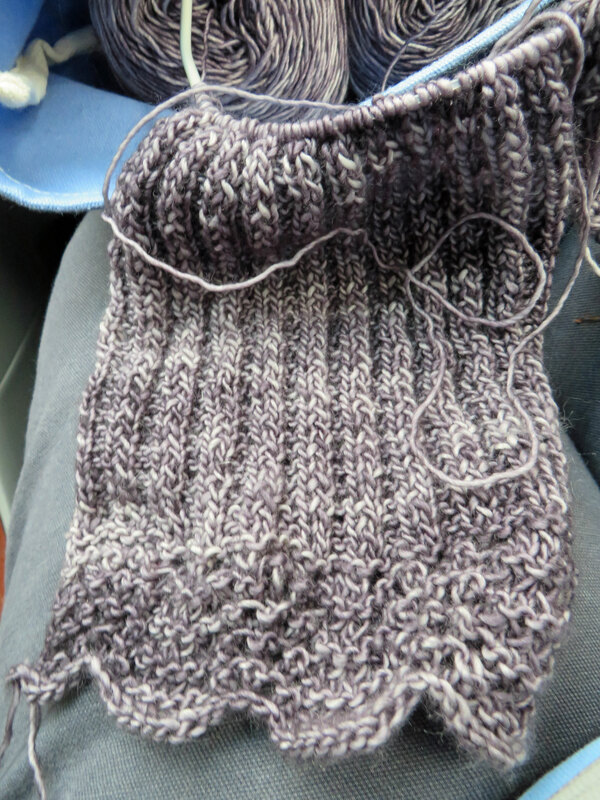 It is coming along pretty well, although I feel like I missed a lot of knitting time last weekend – I am not used to doing all the driving – usually I get good knitting time in on these road trips. But I am nearly done with the fronts. Then come the sleeves, then the back. Lastly, here are a few morning shots from last week – every day was prettier than the last! Except for the tree tops in the backyard, these are phone shots through the windshield, so not great quality. Yes, I stopped, even if briefly, to get them for you. 🙂 Not sure what I will do when the road construction is done and I don’t get forced to stop at the river each morning. oooh, look at that fog bank down by the river! I can’t blame you if you aren’t – I have been neglectful of our relationship. I hope you will forgive me and come back. 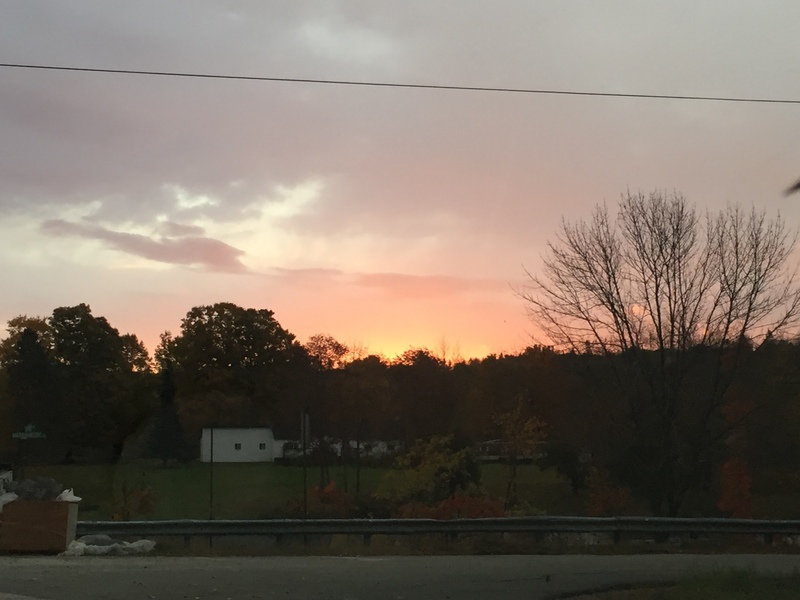 When last I posted – over a week ago – I told you I would be going to PA this past weekend, and while that is NO EXCUSE for not writing, it is in fact what I did. But that sounds so simple. Going to Pennsylvania. Just for a day, really, although three days are needed for the trip. I did not think it would be a huge big deal. I was very much looking forward to seeing where my nieces live now, and where niece C (the younger, if you are trying to keep track of them all) goes to college. She is a sophomore now, and 19 years old. WOW. She was just born last week, you know. So, the plan was to rent a comfortable car in Bangor, pick it up with Mom so we could both be legal drivers on it, and then pick up niece B after her Friday class and head out together. 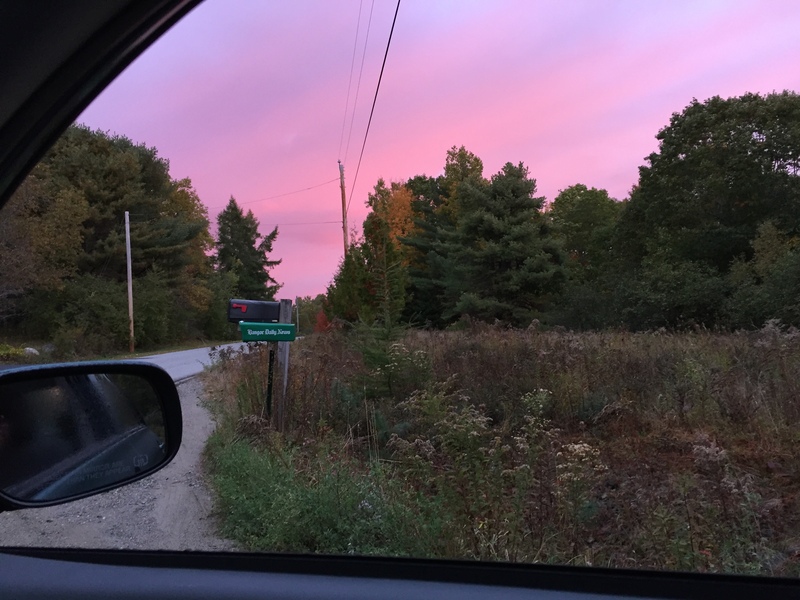 Mom would drive the first part (in daylight, in Maine) and I would do the dark hours of driving after that. I would knit peacefully while she drove. We would drop B off at her home and then proceed to our hotel. I had told them it would be a late check in when I made the reservation, so no problem there as long as we were there by 2. Saturday we would connect with C, see her college, then take her home to her house where we would visit with her mom, and leave both girls, then we would head back to the hotel, planning an early pick up Sunday morning and a long drive back, with Monday to recover and return the rental car. Sounds a bit crazy but not bad. B said it takes her “about 8 hours” to get home from Bangor. I started coming down with a cold on Thursday. I got some non-drowsy drugs and a box of tissues and pretended I would be fine. Mom forgot that she had a class when all these plans were made, so instead of leaving Bangor at about 3, we left Rockland at about 6. Thus, instead of having two drivers on the rental car, we had one. Instead of 8 hours, it turns out it takes 10 because there is construction in Connecticut, even in the middle of the night. A panicked call to the hotel let them know we would not make it by 2. Fortunately, they were OK with that, and glad we called. So FINALLY at something after 3 am, we dropped B off at home and really hoped the barking dog wouldn’t wake anyone but me. It was 4 am when we closed the door of our hotel room and collapsed. But not until after getting a text from C saying she would like to meet us at 10. It is tucked into a nondescript office-type building on a main street, luckily had good signage, so we got there with no trouble. Although small, it had a very nice layout and a good selection. I was looking for Lamb’s Pride, which it mentioned on the website, but couldn’t find it anywhere. I asked, finally, and the store clerk told me that the website isn’t up to date, they are having trouble as the webmaster went out of business. Sigh. Advice we always give new businesses – make sure you own your website. You just never know what the future will bring. So, no Lamb’s Pride (although they offered to order some for me), but a wealth of other gorgeous yarn and really adorable project bags. Lots of Madeline Tosh, I drooled all over it, and many other fine yarns, some I had never heard of, some I had. I almost made it out without spending a dime, can you believe it? I say almost, because as I was perusing the Tosh Light, I saw a cowl that was just plain gorgeous. And so simple! Called Panda Food, it is much like the worm hat everyone has made and loved, it alternates bands of stockinette and reverse stockinette. But it is knit in stripes, and has a cool looking carry-stitch feature (like bamboo, or panda food.) The tag said “free pattern with yarn purchase.” Someday someone should remind me that patterns aren’t that expensive – much cheaper to just buy the pattern. But I knew immediately which yarn I had to have for it, and scooted back across the store to some hand-dyed gradient yarns I had seen. Sure enough, the package had enough colors and yardage in it for this pattern, and there was a big skein that matched that would do for the main color. So, $65 later, I had my free pattern and we were back on the road. C came to greet us in the lobby of her dorm, I was quite impressed with the security there – we had to show ID and be signed in before we could go upstairs. Her room was amazingly neat and tidy, and though small, she and her roommate had made it very homey. Then she gave us a quick campus tour – it’s a small school, but very pretty, and she seemed very much at home and comfortable there. It is amazing how much she has grown up since I last saw her! Beautiful inside and out, she is learning and growing and expanding her horizons. The three of us went to lunch, then went back to her house. 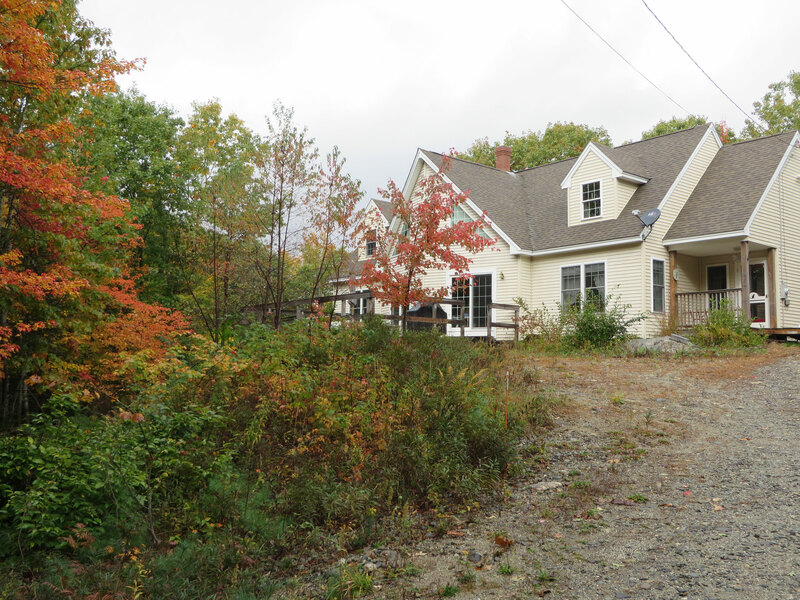 The new home is fairly rural, with apple trees and a broad lawn, a really nice place. While the house is small, it works for their mom and step-dad, since these two are the last of the kids, and will soon be on their own. We spent a couple of hours there, and then headed back toward our hotel. I just wanted to make one stop, because I noticed my glasses were a little wobbly. We easily found the same chain store I bought them at, and while I had hoped for a quick easy (cheap) fix, that was not to be. It seems they could not only not repair the wobbly bit, they found that the weld that held the two sides together was so weak that they were afraid to touch them for fear they would fall apart. Naturally, these are not new frames, so they don’t carry them anymore. Their lab was closed, so they could not make my lenses fit into a new frame. They called the Scranton store, but they could not help either. The fellow was kind enough to say that if we went and got some super glue, he would put it on the weld, but he doubted it would do much good. We raced to CVS for glue, raced back to the store, waited while he glued the frames, and then went in search of supper. The glasses were now wobbly and stinky and besides my sunglasses, the only ones I had with me. We decided to get takeout and eat in the room, and it was a good idea, I think I would have fallen asleep in my dinner if we had sat in a restaurant. But it was Saturday night, and something was going on in town, all the restaurants were mobbed, so even take out took nearly an hour to get. It was after 7 o’clock by the time we sat down to eat dinner. We told B we would pick her up at 7 the next morning, and when that alarm went off, I seriously considered just living in that hotel for the rest of my life. Or at least sleeping another hour. My cold was here in full force, but I swallowed some pills, loved the hot shower, put on my sunglasses, and off we went. After picking her up, stopping for gas and coffee, we hit the road. This time, we got smart and decided to skip Connecticut. We got off of Rte. 84 in New York and went up the NY Thruway to the Mass Pike. It was a MUCH nicer ride, but no shorter. At least it was daylight, and until we met up with Route 84 again, there was no traffic to speak of. Yeah! Now my goal was to get Mom home and get us home before dark, so I could see where I was going. Almost made it! Got Mom home at dusk, didn’t; waste time visiting, we basically dropped her and bolted. I had to put my regular glasses on, and prayed they would hold together for the next hour. Thankfully, they did, in spite of the sneezing and coughing. We were home by 7:30 Sunday night, just as planned. But I felt like a train had run over me! I said to B “If you ever hear me offer to do this again, please remind me to stay there a couple of days at least, this is crazy.” She promised. On the whole, I am so glad I went. I now know where they live, I got to see C and the girls’ Mom, and C’s school. 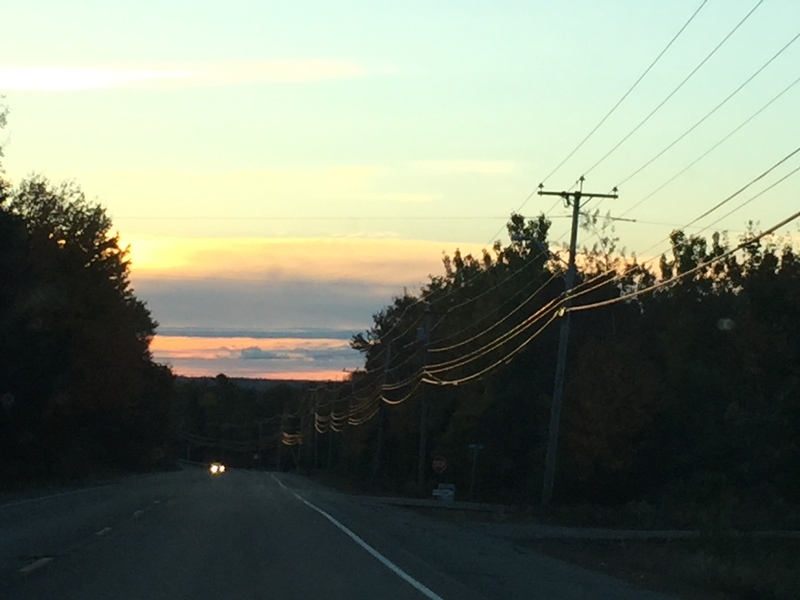 And it was a pretty drive (home, anyway) so that was good. And of course, lots of quality time in the car with Mom and B (although, B slept the ENTIRE way home!) But I hope I don’t have to do that too many more times. I hope they settle down some place a bit closer. Monday A was sweet and spent half of her holiday to drive me to Bangor to return the car (she was a legal driver on the rental as we are married. Not sure why the woman who gave birth to me can’t be a legal driver, but whatever) and go do something about my glasses, which by now were a serious worry. Needless to say, although I had planned to go to work on Tuesday, I did not. I slept half the day, and then sat and knit the other half. I am just now feeling like I might live. There you have it. How my weekend went in just over 2000 words. In another post I will share the other stuff that has been going on lately, and show you the photos off the camera – none from PA, I was too tired to remember to take pix! But there is yarn and knitting and some early mornings. I promise. Before another two weeks go by. Author salpal1Posted on October 16, 2015 October 16, 2015 Categories how it came out, what I am thinking about makingTags family, Gosh Yarn It, Pennsylvania, road trip16 Comments on Yoohoo! Anyone out there? I hope you aren’t looking for photos – I took some, but the camera is across the room, and well, I am not. Amazingly enough, I got things DONE this weekend. You know I always have ambitious lists that take me days longer to accomplish than I hoped, but this weekend I somehow got everything on the to-do list done! Of course, there are things that weren’t on it that maybe should have been, but they aren’t going anywhere, right? It is mostly yard work – yesterday I got up early and “planted” the bushel of daylilies my sister-in-law S gave me a few weeks ago. How I did it – NOT how the master gardener would suggest, but they are daylilies – hard to hurt them, right? I scraped out a shallow trough in the sand and gravel under the satellite dish, laid them out haphazardly, not breaking up the clumps of roots at all. Then, I gathered the bags of garden and potting soil that have accumulated around the yard for my projects, and dumped them on top of the plants. I raked it smooth, watered it (crazy to water after last week, but I know I needed to settle the soil around the roots) and called it done. Now there is a mound of soil between the dish and the little bulb garden. I hope it will someday be a mound of beautiful daylilies. Someday, I will dig them up and thin them and plant them and their offspring properly. A drove, so I knit a swatch for my next project, which is a Charleston baby sweater and hat, and matching mittens for a woman who works with A. Glad I took the time, because as always, my knitting and recommended gauge are quite different. The “baby” is 2 and a half, so bigger than the largest pattern size. I will knit it on bigger needles, but knit the 12month size. I think that this will mean fewer rows, so it will get done faster, and the fabric will have a nice drape. 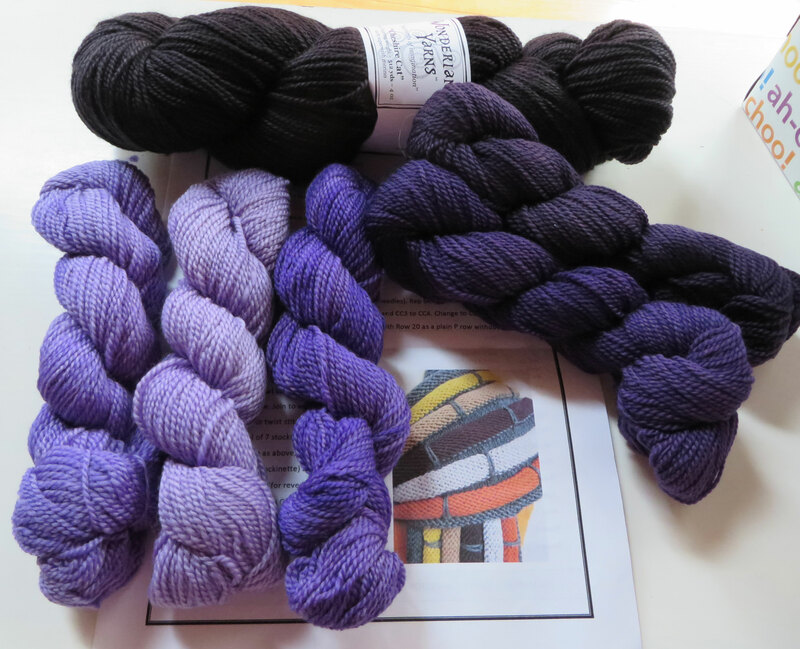 It is Madeline Tosh Light in a color called composition book gray, which has definite purple tones to it. It is going to be quite pretty, I think. Not your typical baby garment – yea! I washed the swatch when we got home, so was able to cast on the two fronts this morning. I always knit the sleeves and fronts of a cardigan at the same time so that they are the same – much easier to get the decreases in the same place if you do them together. Of course, it feels like you are making no progress whatsoever until suddenly you are done. It is also nice to do this when I have whole skeins to work from – if I do them at the end, I am always running out on one side or the other and having odd amounts left on the skeins when I am finished. This way, I will use up any leftovers on the back and have all my leftovers in one skein, not two partial ones. Then it as back out into the yard. 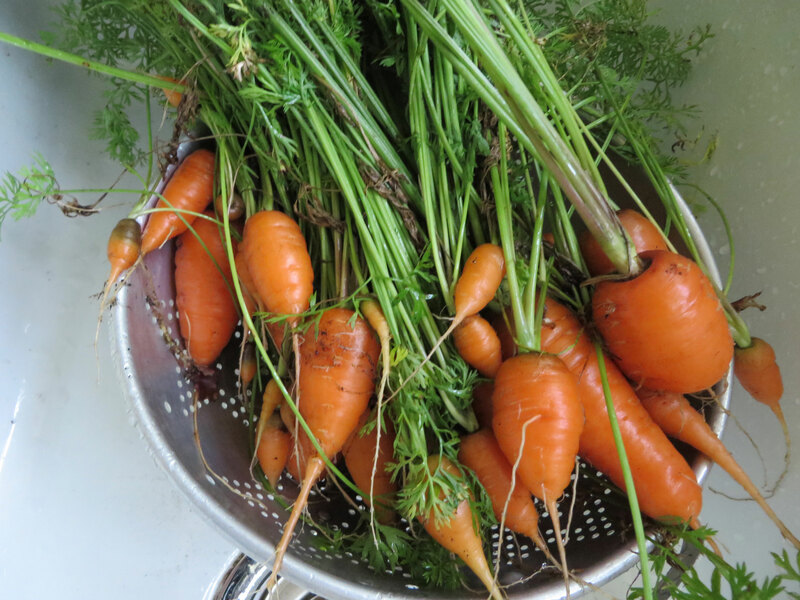 I harvested the carrots (there is a photo of the colander full of orange goodness on the camera. You should see how pretty! And you will, someday.) I will probably make curried carrot soup with them this week sometime for the freezer. They were the last thing to come in from the garden, so I began the process of getting ready for fall. The asparagus bed is now cut back and ready for mulch. I put a bag of compost on it after I cut it back, so it should be happy next spring! I also put a bag of compost in the bed where the carrots were, and planted a whole lot of garlic in there. Let’s see if I do a better job of growing that next year than I did this year! I will get a bale of straw mulch, and mulch the asparagus, garlic and those crazy strawberries with it. That will hopefully happen this week. The strawberries are the bane of my existence. I fixed them a special raised bed several years ago, and made sure they got very good soil, straw mulch in the fall, fresh straw in the spring, and for years got very few, very small berries. Last year I decided enough is enough, I could use that ground for something that grew better and produced more. So I didn’t mulch them last fall, nor this spring. But I never got around to ripping them out. I also scooped leaves and debris from the pool without getting in it – a bit chilly for wading today. It is awkward to do from the edges but I can if I work at it. That and a few other raking/weeding chores got done, and now I am on the couch with a laptop, and wondering why I didn’t bring myself a beverage and a snack before I sat down? And the camera? Next weekend I am heading off to Pennsylvania with Mom and niece B – we are going to visit B’s sister C at college, and give B a day or two at home with her mom and dog, which I think she will welcome. She has had a tough month of start to her semester. I haven’t seen C in so long, it will be nice to see her and where she goes to school. Lot of driving, though, good thing we have Monday off to be lazy. A begged off the trip with the promise that she would finish building the bookcases for the loft – have I ever written that those were going to get done imminently? Lol, I know I have. But I think that she really means it this time. I hope so – although it means I have to paint the room they go in, and then them as well. But if we can get that loft done and the books unpacked, it will feel amazing! This summer there have been crazy fires out west, and when they show the stories on the news, I always think about “what would I take if I had to suddenly leave home, and didn’t know if it would be here when I could get back?” I have a mental list. It includes, of course, the cats, and some knitting and then it kind of gets lost in the weeds. But it never occurred to me to think what I would do if I could not get home. That happened to me Wednesday. It was only for a couple of hours, but it was scary! It rained. It rained a lot. We got almost ten inches of rain in 12 hours, and that was just more than the ditches and culverts could bear. As a result, when I tried to go home from work, I could almost but not quite get there. There are two roads we can take to get to our little lane. Both of them had washouts so severe that they were closed. I couldn’t really wrap my head around it, and checked them both twice. How could I not get home? What was almost worse was that I could not get to any friend or family member that I could think of in those moments of disbelief. So many roads were closed! I COULD drive the 20 miles back to work, but I hesitated to do that in case the road washed out and I couldn’t get this close to home again. So I went to the fire station and waited there, watching the map get more and more pins in it showing road closures. I listened to the dispatcher talk to firemen on the scene in so many locations – directing traffic, getting people out of their cars, waiting for tow trucks to get the cars out of the water. Learning of more road closures. How could so many roads be closed? Where would people go who could not get home from work? I couldn’t get home to make sure that HOME was OK, that the cats were fine. I knew in my head that the cats were asleep and didn’t know anything unusual was happening, but in my heart, I was terrified for them. What if I couldn’t get home for a few days? They had some dry food but not enough for a long absence. I could call the neighbor, but how would they get in the house? It was a long wait, but eventually the road crews got one of the roads cleaned up and repaired enough to be passable. I headed for home, and found that all was well. Our lane was in rough shape but with care, I could get down it. My house was warm, safe, and dry. Power was on, cats were sleeping peacefully by the window. They never noticed I was late. Or if they did, it didn’t alarm them.